Why is marijuana illegal? Do a quick internet search and you’ll find a series of generally related answers: racism, fear, corporate profits, yellow journalism, ignorant and incompetent legislators, and bureaucratic preservation. Almost all of these are also tied to one man: Harry J. Anslinger, Commissioner of the Federal Bureau of Narcotics from 1930-1962. While these issues are critically important to consider, they help explain only portions of our nation’s marijuana prohibition story. Indeed, in part one of this series I examined the origins of cannabis regulations dating back to the mid-nineteenth century. These state level statutes demonstrate a clear, historical precedent for medicinal cannabis legislation in the United States, driven by the concerns of medical doctors and pharmacists seeking both their own professional authority and consumer protections in the marketplace. My objective is to suggest that these early developments demonstrate a far longer and more complex history of cannabis regulation than most existing versions of the story suggest, especially those readily available on the internet. It’s not that those internet versions of marijuana prohibition are entirely wrong; it’s that they often sustain a sensational narrative that misses critical components of this longer history and the original scholarship from which they are derived. President Franklin Roosevelt signed the Marihuana Tax Act (MTA) into law on August 2, 1937, officially placing marijuana alongside cocaine and the opiates as a federally regulated “narcotic drug.” Technically a revenue measure, the MTA was similar to the Harrison Narcotics Tax Act of 1914, which first restricted opium, cocaine, and their derivatives at the federal level. With Harrison, the federal government relied on its power of taxation to regulate interstate commerce rather than directly regulating the practice of medicine, which few believed it could do at the time. Driven by international treaty obligations and Progressive Era zeal, Harrison represented an evolution in drug control, emerging from nineteenth century consumer protections and their federal consolidation under the 1906 Pure Food and Drug Act. Its status as a revenue measure that restricted consumer behavior barely survived a series of legal challenges. This fragile constitutional footing was a significant reason that marijuana was not simply added to the list of narcotics regulated by Harrison and was instead given its own law modeled on the “prohibitive tax” principle found in the National Firearms Act of 1934. By restricting the sale of Marihuana Tax Stamps sold under the MTA, the Federal Bureau of Narcotics essentially prohibited the sale and distribution of marijuana throughout the country. 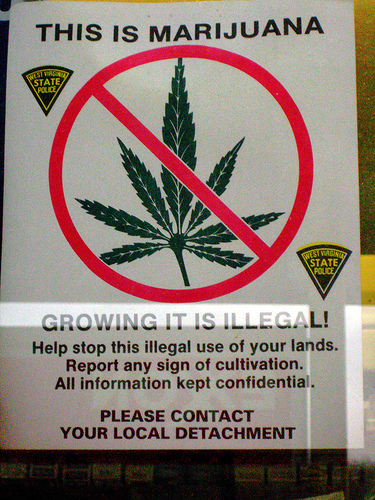 Plant eradication campaigns took place throughout the country, and for the next two decades marijuana use remained relatively light, as did most enforcement measures. Then, with passage of the Boggs Act in 1952 and the Narcotics Control Act in 1956, Congress established mandatory sentencing guidelines for first time cannabis possession, ranging from two to ten years in prison with fines of up to $20,000. By the mid-1960s, however, a growing belief that marijuana use was both pleasurable and benign led to its widespread popularity among a young cross-section of the population. Many of these white, middle-class users subsequently found themselves in court facing harsh, mandatory minimum sentences for marijuana offenses. This resulted in a significant outcry around the country to repeal these sentencing laws. In 1970 Congress did just that, removing mandatory penalties for cannabis use while also classifying it among the most dangerous and addictive drugs under the Comprehensive Drug Abuse Prevention and Control Act of 1970. Moreover, between 1973 and 1978, eleven states legalized or decriminalized the possession of marijuana up to an ounce. As a product of this relatively brief moment of debate on marijuana liberalization in the 1960s and early 1970s, scholars began investigating the history of drug use and prohibitive policies in the United States. This period of scholarship ultimately produced many of the most influential texts on the history of drugs in America and helped establish an interpretative basis for the origins of drug prohibition. This was especially true with regard to marijuana and passage of the Marihuana Tax Act. One of the first influential texts was Howard Becker’s 1963 publication Outsiders: Studies in the Sociology of Deviance, which laid the basis for what became the “Anslinger Hypothesis.” Becker asserted that, “The Treasury Department’s Bureau of Narcotics furnished most of the enterprise that produced the Marihuana Tax Act.” Essentially, he argued that Commissioner Anslinger and the FBN had acted on their own initiative to turn marijuana into a public menace and facilitate passage of the MTA. This view proved highly popular and influential, helping target significant research on Anslinger and the FBN – a trend that has largely continued for the last fifty years. While Becker and many others focused their research (and their blame) on the role of Anslinger and the FBN in concocting the Marihuana Tax Act, another synthesis of marijuana prohibition also took shape in the early 1970s. The outlines of this interpretation were posited in 1970 by Richard J. Bonnie and Charles H. Whitebread II, two recent law school graduates who published, “The Forbidden Fruit and the Tree of Knowledge: An Inquiry into the Legal History of American Marijuana Prohibition” in the Virginia Law Review. Their interpretation took a broader and more nuanced view of marijuana prohibition by noting the influence of its connection to Mexican immigrants, the role of racial prejudice, and the importance of the legal challenges that confronted the passage of a federal marijuana law. David F. Musto offered further evidence for the Mexican hypothesis in his 1972 article, “The Marihuana Tax Act of 1937,” and again in his seminal 1973 book, The American Disease: Origins of Narcotic Control. Countering notions that Anslinger and the FBN had single-handedly produced the “marijuana menace,” Musto stressed that, “the anti-marihuana law of 1937 was largely the federal government’s response to political pressure from enforcement agencies and other alarmed groups who feared the use and spread of marihuana by ‘Mexicans.’” In fact, Musto maintained that the FBN initially resisted calls for federal marijuana prohibition because Anslinger feared it might become a significant enforcement burden for the relatively small agency. Each of these studies added depth and subtlety to the history of marijuana prohibition. 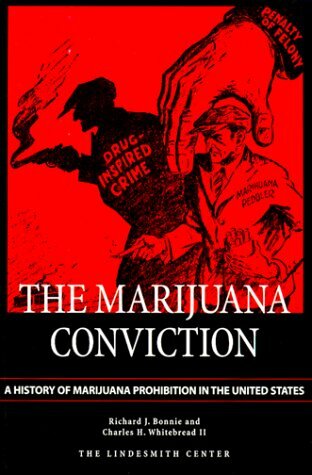 Originally published in 1974, “The Marihuana Conviction: A History of Marihuana Prohibition in the United States” (Charlottesville, VA: University Press of Virginia) was reissued as a Drug Policy Classic Reprint from the Lindesmith Center in 1999, and remains the standard interpretation of marijuana prohibition in the United States. In 1974, as a follow-up to their first article, Bonnie and Whitebread published The Marihuana Conviction a book-length monograph that firmly established an interpretation for marijuana prohibition in the United States that has remained both highly influential and largely uncontested to this day. By drawing on and challenging the burst of historical literature on marijuana that emerged during the late 1960s and early 1970s, they offered a more nuanced and balanced interpretation than any previous work. Similar to Musto, they maintained that Mexican immigrants who smoked marijuana began appearing in concentrated numbers across the southwest during the 1910s, at which point those states responded by passing prohibitive measures aimed at stifling the use of marijuana and the proliferation of crime that allegedly followed its progress northward from the Mexican border. They also argued that during this period marijuana acquired its classification as a narcotic drug that caused insanity and criminality. Moreover, to help explain cannabis laws in states without sufficient Mexican immigration, Bonnie and Whitebread asserted that an “anticipatory” fear of the drug prompted state legislation. One can easily see how this scholarship was, and continues to be, highly influential in the debate on marijuana criminalization. Narratives of racism, propaganda, and conspiracy from the 1910s and 1930s – especially with such clear contemporary evidence on the racist nature of the War on Drugs – make a powerful case for the folly of continued marijuana prohibition, especially one that appears ill-conceived from the beginning. Yet, as I hoped to show in part one of this series, there is a great deal more to the history of cannabis regulation in the United States than the propaganda and racism regularly attributed to Harry Anslinger and the FBN in the 1930s. Indeed, Isaac Campos has recently argued that the fundamental components of the “reefer madness” campaign were actually notions well rooted in Mexico during the nineteenth century. Moreover, the original research on Anslinger and the FBN produced in the 1960s and 1970s was also the product of a historically specific moment of marijuana liberalization; one that was turned back during the early 1980s in-part by a nationwide parent movement that pushed congress to enact a new series of mandatory minimum sentences under the Anti-Drug Abuse Act of 1986, including marijuana. Again, the argument here is not that those internet sites or editorials pointing to Anslinger and xenophobia are wrong, but to suggest that they are considering only one part of a much longer and more complex history. In our own moment of liberalizing sentiment on marijuana, we could do far worse than to call for a more inclusive history alongside more open and rigorous science. There is no doubt much to learn from both. Here is part 2 of Adam Rathge’s series on marijuana criminalization. Rathge next explores some of the previous narratives that explained marijuana criminalization. Rathge argues that marijuana prohibition is a result of a much longer and more complex history than most scholars have acknowledged in the past.